Tibetan Prayer Flags have long represented hope, strength, and well being for the people they represent. Prayer Flags were originally used by shamans in healing ceremonies. As the fragile flags are blown in the high mountain winds, they slowly unravel, the threads blowing away into the wind. Each thread that unravels represents a prayer of hope, strength, and health for the person it honors. Radiating Hope climbers carry Tibetan Prayer Flags on their expeditions, 3 to 5 times a year. You can help by dedicating a Prayer Flag in honor of a cancer patient. 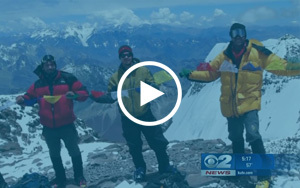 The cancer patient’s name, along with a message, will be placed on a Prayer Flag and taken on each expedition, where they will be flown at the peak in the patient’s honor. They'll also receive a certificate stating that a flag was donated in their honor.